One of my absolute favorite things about Caribbean vacations is the excursions. 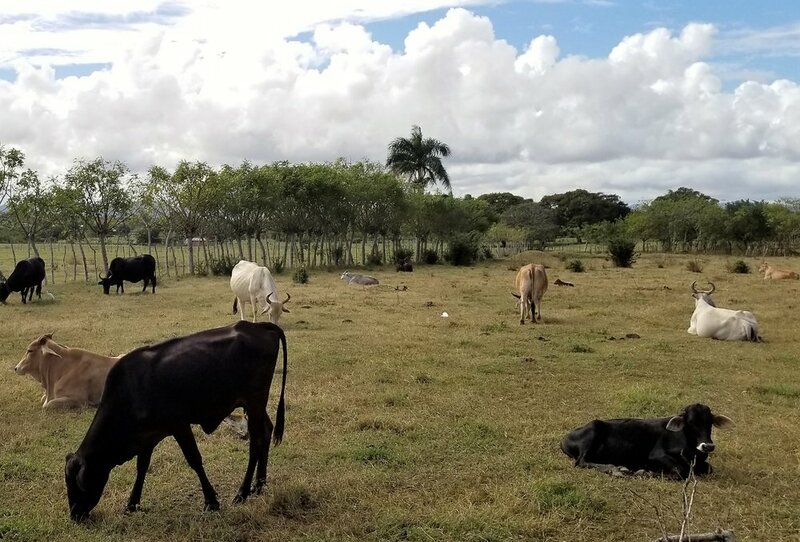 Although it can be kind of annoying to be bombarded by salespeople inviting you to go on a tour with them, once you've decided on an excursion and arrived at the designated location, the rest is relaxing and enjoyable. Most excursion guides have thought ahead so they can take care of all your needs - that frees you to just have fun! 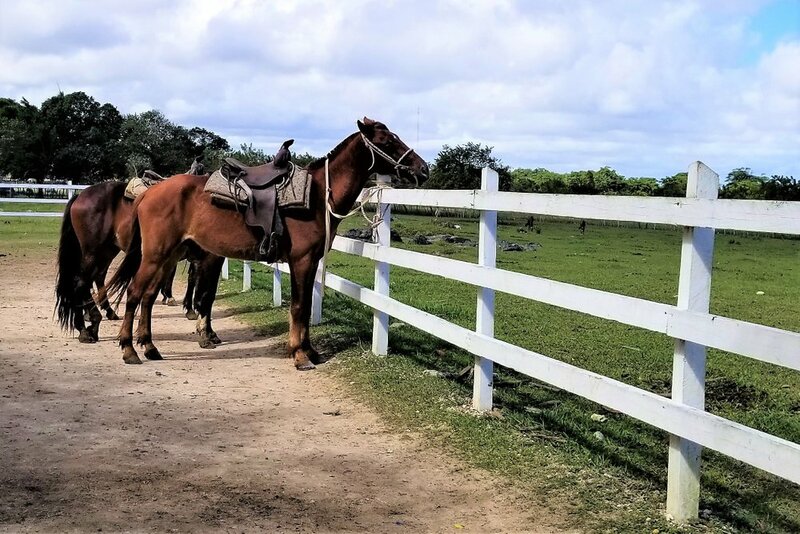 Read on to learn about the 2 Hour Horseback Excursion in Punta Cana. When you book an excursion, there is a lot you are not told. For example, no one told us that we would be picked up in an open air tour bus with nothing in the way of a suspension system. We weren't told that we would be packed like sardines into this bus for the entirety of the 40 minute ride to the stable. Lest I sound like I am complaining, let me clarify. It was fun. I enjoyed the wind in my hair and the camaraderie that develops when packed in close quarters with compete strangers - many of whom don't share a language. I enjoyed the sun in my eyes and holding onto my hat to keep it from flying off and down the highway. But still, they could have at least mentioned it. By the time we arrived at the stable, we were down to only 4 participants. The rest of the bus load had been dropped off at a different location to ride dune buggies. Stepping off the bus, we were greeted by an enthusiastic guide who directed us to a small stall where we were to wait while he had us all sign waivers, don helmets, and listen to his safety instructions. Being tourists, we dawdled... a lot. We stopped to take pictures of everything! I needed the palm trees, and the horse locked in his stall, and the building itself and more palm trees... you get the idea. I'm sure our guide had seen it all before. He did a decent job of masking his impatience. 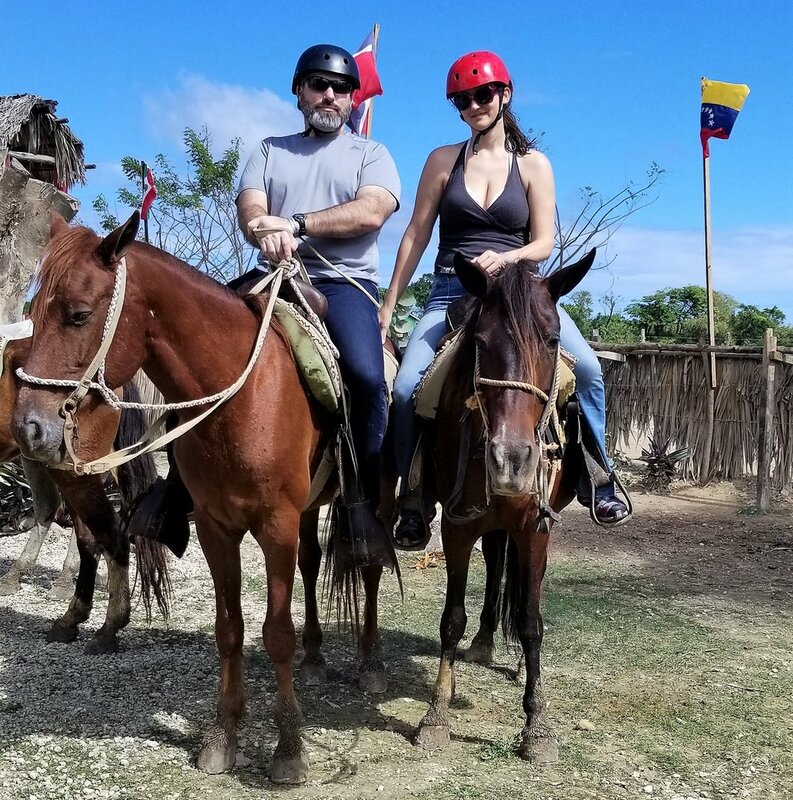 Finally we were each assigned to a horse. I asked the name of my sable mare as I swung into the saddle. Hmm...that means donkey, I thought as I asked the guide to repeat it a few times. Yep, I rode a horse named Donkey. Finally, we were all mounted. 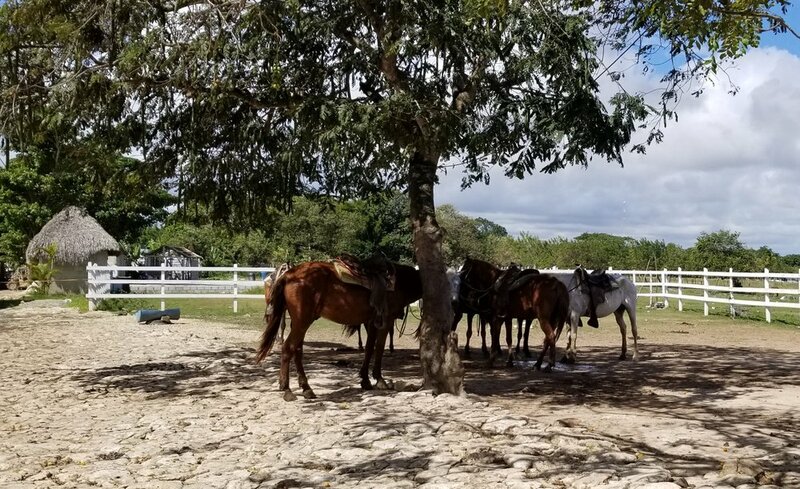 The other couple who had joined us seemed to have some difficulty in getting on their horses, but soon we were heading off into the Dominican jungle. 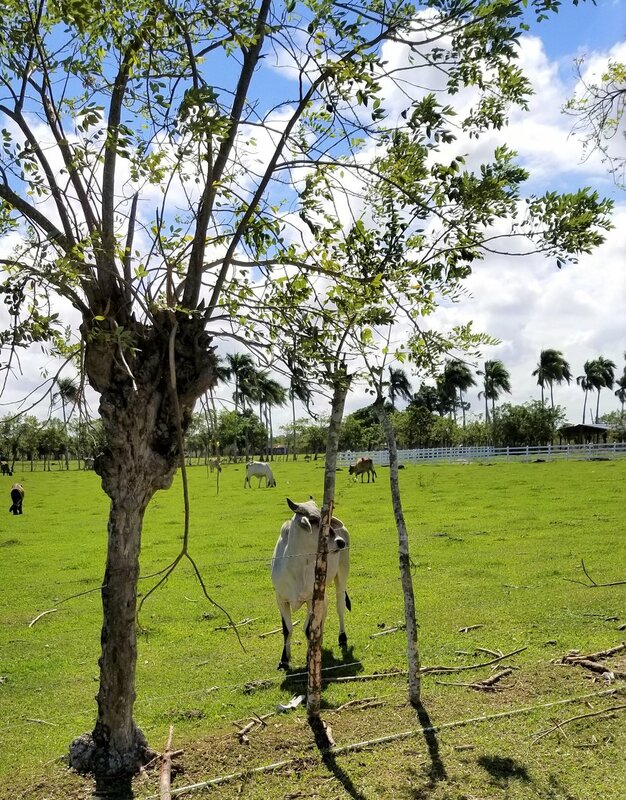 All along the trail were Dominican cows. I'm not sure of the breed, but they had kind of floppy ears and looked very soft and fuzzy. As we ambled along, our guide nickered to our horses in an attempt to get them to speed up. It worked kind of well, but only as long as the guide was making noises at them. These horses were obviously not interested in getting anywhere fast. 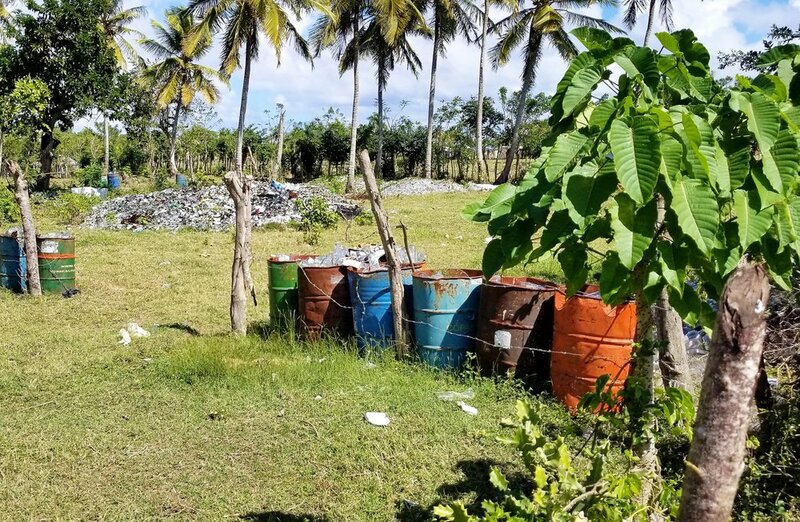 Dominicans must be big fans of recycling. At multiple points along the way were huge piles of recyclable materials. They seemed quite out of place in the middle of an otherwise agricultural landscape. It made me wonder if this is the end destination of the recycled materials on the island, or if this is just one more stopping point on their journey. Our guide said that this was going to be a hotel, but the builders ran out of money before it could be completed. It was quite close to the beach. I'm thinking it would be a great fixer upper. Anybody want to go in on it with me? On the other end of the spectrum is this Dominican house. As we trotted by, we saw locals in the backyard preparing a meal over an open fire. There were babies running around naked and chickens clucking. It was sad in a way to see the level of poverty as I rode by on a rented horse. It looked like a lot of work, especially compared to my pampered meal service at the all-inclusive resort. I definitely questioned my choices regarding luxury expenses. Here's another thing they don't tell you. You're going to stop at one of the most beautiful beaches on the entire planet. We parked our horses in a shady grove nearby, ditched our helmets, and walked down a sandy path to the bluest waters. The beach was not crowded with chairs and umbrellas. It was perfect. I was the only person in our little group who happened to be wearing a swimsuit, so I quickly stripped down and jumped in. After the sweaty heat of the ride, the water was the most refreshing way to spend the 10 minutes our guide had allotted. The sand was silky under my toes and the waves crashed over my head as I bobbed in the ocean. I felt bad for the others - they waited and chatted in the heat of the day - missing out on all this perfect ocean. We stopped once for a quick sales pitch at a little stop coincidentally placed along the path. They sold Dominican coffee, cigars, trinkets, and the ever popular mama juana, a local drink said to be good for what ails you. Our guide encouraged us to partake of the free samples and we walked away having purchased a jar of cocoa nibs. The return journey traced the same route as we had taken in. 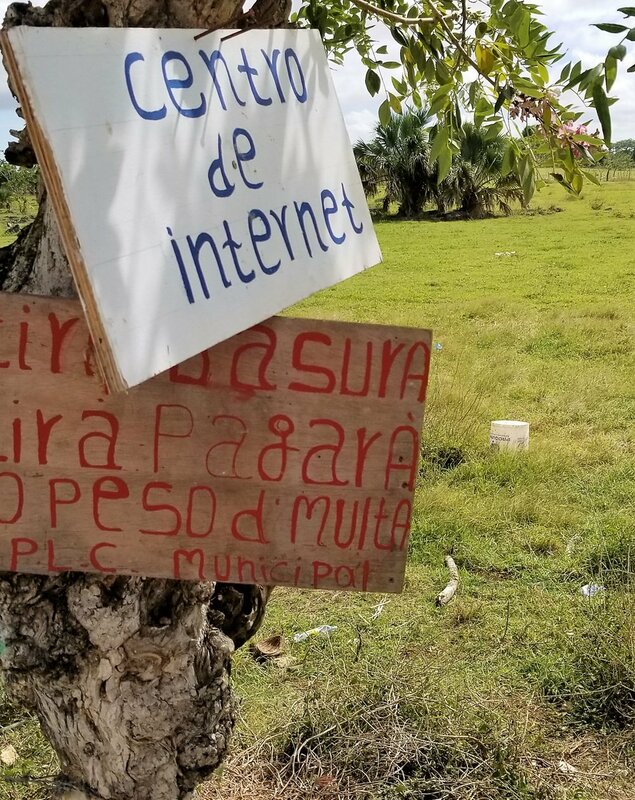 We passed back through the village, the Center of the Internet, and the piles of recycling. We saw the same velvety cows chilling in the fields. The big difference? This time our bums were all quite sore from 2 full hours of a horse that isn't quite trotting. 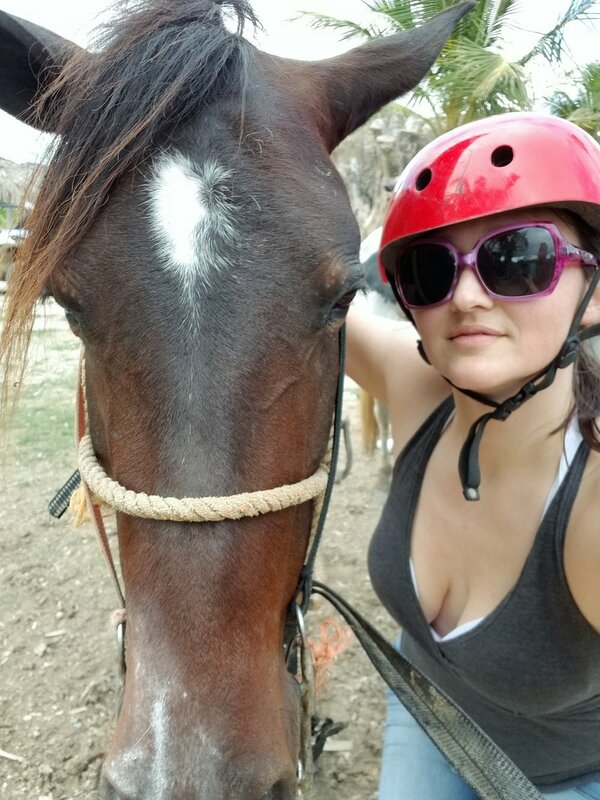 We finally dismounted and I took the opportunity for a selfie with my horse Burro. 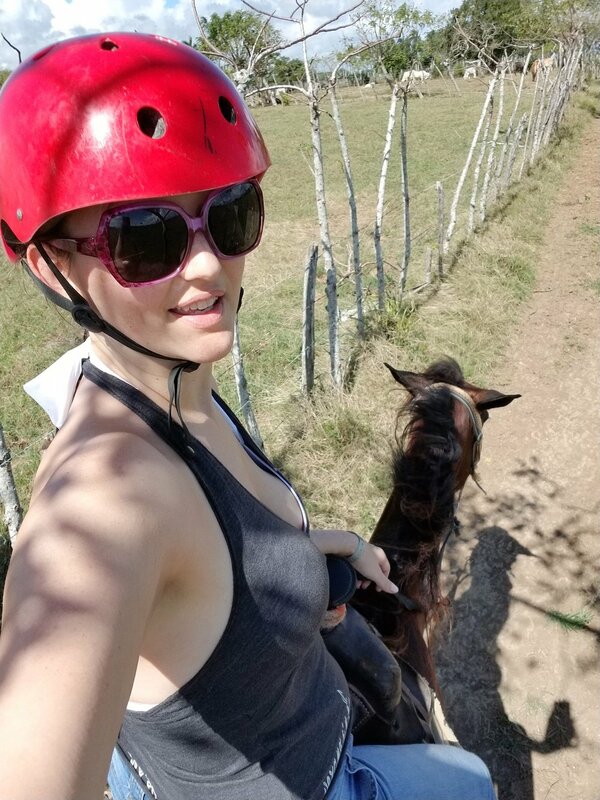 While I had a great time, I don't think I'll do the 2 Hour Horseback Excursion again. Drop a line in the comments with your favorite excursion. What should I check out next time? Oh yeah, and hit me up if you feel like traveling. I'm happy to help you book your next vacation. Oh yeah, all photos are mine and used with my permission. Thanks!